We just returned to New York from Spain (with a detour to France) and we are missing tapas bars already. There is nothing like buying an inexpensive glass of wine--usually around or under $2 US--and receiving a free small plate to enjoy with it. This tapas bar seafood salad, which is also known as salpicon, is one of our favorites. Tapas Bar Seafood Salad. Photo by Frances Janisch for The Fire Island Cookbook. When you walk into a bar in Spain, you will see a glass-covered case filled with salads and cooked foods. With each glass of wine you order, you will be offered a tapa, or small plate of food—for free! Cold seafood salad is always a sure bet, especially with a nice, crisp glass of Albariño. Peel the shrimp and remove tails. In a medium saucepan, bring salted water to a boil over high heat. Boil 3-5 minutes, until shrimp turn pink. Empty shrimp into strainer, and rinse with cold running water. Boil the octopus in salted water until tender. This may take between 30 and 60 minutes, depending on the thickness of the octopus. After cooking, allow to cool to touch, and cut into ¼ inch slices. Break the crab meat into ½ inch pieces with your fingers and a fork. Place the shrimp, octopus, and crab meat in a large glass or ceramic bowl. Rinse and seed the peppers, and cut into lengthwise into ¼ inch slices, and then cut each slice in half crosswise. Dice the onion. Add peppers, onion, and olives to seafood in bowl. Toss lightly. Add olive oil and lemon juice to bowl, and mix to coat seafood and vegetables. Lightly salt and pepper to taste. Serve cold. May be refrigerated before serving. This can be made in the morning, and plated and served at dinner time. The bracing minerality of this clean white wine is just right with seafood. Note: You may substitute 1 pound cleaned calamari rings for the octopus. Boil approximately 3-4 minutes, until tender. From THE FIRE ISLAND COOKBOOK Copyright © 2012 by The World Wine Guys, LLC published by Atria Books, a division of Simon & Schuster, Inc.
Days may be growing shorter and evenings just a touch cooler, but tomato season is still going strong. Our stacked Caprese will have your friends oohing and aahing when it arrives at the table, although we promise you it is one of the easiest dishes you will ever prepare. The key is using the freshest tomatoes you can find, so the time is now. Stacked Tomato and Mozzarella Caprese Salad. Photo by Frances Janisch for The Fire Island Cookbook. There are few starters that are as dramatic and so easy to make. Using perfectly ripe tomatoes and freshly made mozzarella you can create a delicious architectural delight. Although this is a signature dish from the island of Capri, we first had this layered presentation in Porto Palo on the island of Sicily. Fresh basil, peppery olive oil and sea salt bring out the earthy quality of the delicious tomatoes that grow in the island’s mineral rich volcanic soil. Wash and dry the tomatoes. Cut the bottoms off of each (so that they can stand upright on the plate) and discard. Slice each tomato horizontally into four slices. Keep each tomato together and set aside. Horizontally slice each fresh mozzarella ball into 12 equal slices, for a total of 24. Begin assembly by placing the bottom slice of each tomato in the center of a medium sized plate. Salt lightly. Top with a slice of mozzarella and two basil leaves. Add another slice of tomato and repeat until each stacked Caprese salad is complete. Carefully spear each with a bamboo skewer, garnish with the remaining basil leaves and set aside. Do not refrigerate if you plan on serving in the next 90 minutes. When ready to serve, drizzle each with extra virgin olive oil and sprinkle with a bit of sea salt. Delightful crisp flavors of green apple and ripe stone fruits are accented by a touch of toasted brioche and creamy butter. The creaminess will hold up to the cheese, while strong acidity is ideal with ripe tomato. September is a produce lover's dream. We get the last of the summer fruits and vegetables alongside the first of the fall's bounty. Corn and tomatoes are at their very peak, and it is wonderful to enjoy them together before they are gone until next summer. Locally grown corn and tomatoes are plentiful in the East from July through September. There are so many ways to use them at mealtime and one of our favorites is this simple salad—the fresh flavors really speak of summer. The minerality and bright acidity of the tomato combines beautifully with the delicate creaminess of the sweet corn. We always use a superior quality cold pressed extra virgin olive oil. There are some excellent oils coming from California wine country. The subtle yet luscious peppered flavor is the perfect compliment to our Hand Shucked Corn and Tomato Salad. Shuck the corn, making sure to remove all of the silk threads. Stand each ear on end and using a sharp knife, cut the kernels away from the cob. Core and seed the tomatoes. Cut the tomatoes into eight wedges and then cut each wedge into two to three pieces. Toss the corn and tomatoes together in a large glass bowl and season with salt and pepper. Add the extra virgin olive oil and toss. Cover with plastic wrap and allow to sit 1-2 hours before serving. This allows all of the flavors to meld together. Hearst Ranch Three Sisters White, Grenache Blanc-Marsanne Blend, Paso Robles, California. Hints of tangerine, orange blossom and apricot along with racy brightness make this a wine you’ll want to start every meal with. Although in the off-season, aka the part of the year that is not summer, we are perfectly content with steamed asparagus, in warmer months we delight in lighting the grill and relishing flame-kissed tender green stalks of goodness. We then double down on the deliciousness by topping our asparagus with pancetta-shallot vinaigrette. Hiking in the hills above our Spanish house we find wild spring asparagus. We love the old men who collect handfuls and then sell them at the market for 1 euro per bundle. Rinse the asparagus stalks and cut off the bottoms. Place approx 1/8 cup of olive oil and 1 tablespoon of salt into a zippered plastic bag. Add 1/3 of the asparagus and shake to coat evenly. Repeat 2 times. Place stalks directly on the grill for approximately 2-3 minutes. Remove and place on a serving platter, set aside and do not cover. Fry the pancetta in a large cast iron skillet until almost crisp, turning once. Drain on paper towels, but conserve the drippings. When cool, cut or crumble into fine dice. Finely dice shallots. In a glass measuring cup, combine the olive oil, pan drippings, diced shallots, balsamic vinegar and diced pancetta. Stir well and cover with plastic wrap. Set aside. Arrange the grilled asparagus on a large serving platter, drizzle the vinaigrette to evenly coat. Top with a few small pinches of Maldon Salt or Fleur de Sel and a few twists of black pepper. This lovely wine from the town of Orvieto in Umbria has aromas of fresh peaches and almonds. Hands down, basil is our favorite herb; we seriously can not make enough pesto each summer. We know that many of our friends are trying to cut down on carbs and are avoiding pasta, so we have found a great use for all of our pesto. We slather it on grilled chicken breast. Try it for yourself! Pro tip: Pesto can be frozen in ice cube trays and defrosted as needed over the next several months. The hot days of summer cause our garden to grow like wildfire. We usually have a bumper crop of basil: And what better way to use it, than to make delicious homemade pesto? In a glass baking pan, marinate the chicken in olive oil, 2 tablespoons of pesto, salt, pepper, and lemon juice. Coat both sides of the breasts well. Refrigerate for at least 2 hours. When ready to serve, grill the chicken approximately 5-7 minutes on each side, depending on thickness. Cut the cheese into 1 to 2 inch chunks. Place in the food processor and process until coarsely grated. Add in the pine nuts, garlic, lemon juice, black pepper, and basil leaves. Process for approximately 45 seconds to 1 minute, until you have a thick paste. Use a scraper to push down the sides. Slowly drizzle in the olive oil through the push-tube until you have a thick liquid. Add salt to taste if necessary. Transfer to an air tight container and set aside. Do not refrigerate if you plan on using the same day. Arrange the grilled chicken on a large serving platter. Spoon pesto over the entire platter. Garnish with sliced lemons and whole basil leaves. Serve. A medium bodied Chardonnay, Dogajolo complements the vibrant freshness of home made pesto. Smooth and slightly racy, this 100% Pinot Bianco from the foothills of the Italian Alps is ideal with this earthy pesto. While we are all loading up on tomatoes--or our gardens are providing them--and it's too hot to cook, treat yourself and your loved ones to a lunch or dinner of refreshing gazpacho. 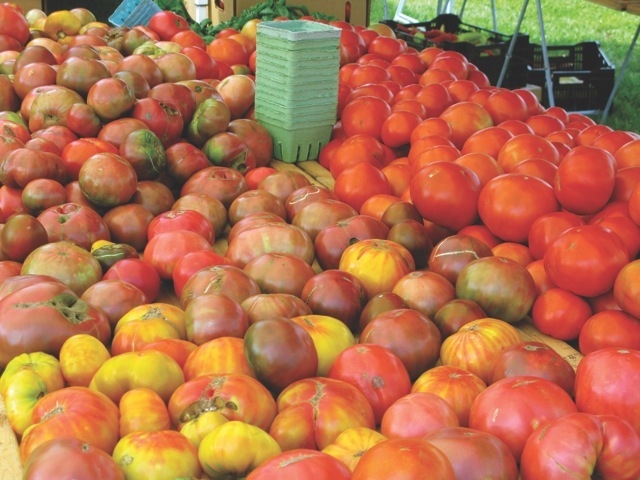 There is nothing--and we mean nothing--like a bushel of tomatoes fresh from the farmers' market. It's that tomato time of year, and we can't get enough of them. One of our favorites--and our friends' favorite too--is this raw tomato sauce for pasta. We included it in our first book, The Fire Island Cookbook. If you have tomatoes growing in your garden, lucky you, but if not, there's no time like now to head to the farmers market or a farm stand and get a bushel of juicy, sweet summer tomatoes. The best thing about this recipe is that you can toss the tomatoes, basil and olive oil together in the morning, head to the beach, and let it "cook" on your counter while you are enjoying yourself in the summer sun. When Mike was growing up in New Jersey, his mother would buy copy-paper boxes filled with slightly bruised tomatoes for just a few dollars. The really banged-up ones went into cooked tomato sauce, but the ripest and best were set aside for this amazing raw tomato sauce. It seems as though it might make a lot, but trust us—there won’t be any leftovers! 1. Core and seed the tomatoes. Turn each cored tomato upside down on several layers of paper towels and allow the excess juice to drain for 30 minutes. Cut each tomato into 6 to 8 slices, and then cut each slice into about 8 “cubes.” In a large glass bowl, combine the tomatoes, 1 tablespoon salt, black pepper, pepper flakes, and oil. Cut the basil into strips with scissors, or tear by hand, and add to the bowl. Mix well with a wooden spoon. Cover with plastic wrap and let sit for a few hours. Do not refrigerate. 2. Bring 8 quarts water and 2 tablespoons salt to a rousing boil. Add the pasta and cook, stirring occasionally, according to package directions. (For al dente pasta, cook for about 1 minute less than recommended.) Drain. 3. Transfer the cooked pasta to a large serving platter. Top with the crudo sauce. Grate Parmigiano-Reggiano over the pasta using a Microplane. WINE PAIRING: Planeta Rosé: The fragrant acidity of this pomegranate- and floral-scented Syrah rosé agrees perfectly with fresh ripe tomatoes. Fusilli With Crudo Tomato Sauce. Photo by Frances Janisch. We divide our time between our homes in New York City and Southern Spain. We travel the world by air and land visiting wine regions and sail the seven seas teaching wine to luxury cruise guests. So far we have only been to six continents, but we fully intend to be the first journalists to visit Antarctica when they start making ice wine.